This post if part of the series on the Web Analytics Maturity Model, a research project for my MBA. See the first two posts on this topic: "Overview of the Web Analytics Maturity Model" and "Definition of Web Analytics". A capability maturity model (CMM) contains the essential elements of effective processes for one or more disciplines. It also describes an evolutionary improvement path from ad hoc, immature processes to disciplined, mature processes with improved quality and effectiveness. All reviewed models share some similarities in their attempt to define a "framework and objective criteria to determine the sophistication of an organization’s measurement and analysis skills". In the next couple of posts I will propose a review of some existing models (listed in the 1st post) and how they apply to the objective of defining a web analytics maturity model. Some prominent voices in the web analytics industry claim that "web analytics is hard". Rather than spreading fear, uncertainty and doubt, I’d rather be of the school of thought that web analytics can be easier if approached in the right way and given enough time. Complex projects can only be achieved pending goals and expectations are realistic, resources are allocated and execution is sound. Web analytics, albeit its own challenges, isn’t so different or any harder than other challenges faced by organizations competing in today’s environment. Maturity models are not strict paradigms and they often prompt criticism whenever a specific item doesn’t match one’s own view of the world. While it is acknowledged maturity levels and their features contains gray areas and are subject to interpretation, the important elements are not so much the specifics of each level but the structure of the maturity model. Maturity levels: A defined evolutionary plateau toward achieving a mature process. Process capability: The range of expected results that can be achieved by following a process. The process capability provides one means of predicting the most likely outcomes. Key process areas: Cluster of related activities that, when performed collectively, achieve a set of goals considered to be important. Goals: The goals define the scope, boundaries, and intent of each key process area. 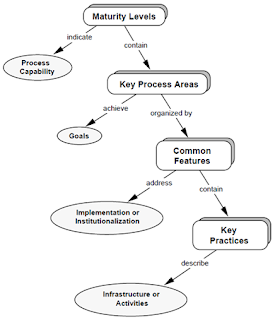 Common features: Common features are attributes that indicate whether the implementation and institutionalization of a key process area is effective, repeatable, and lasting. Key practices: Key practices describe the infrastructure and activities that contribute most to the effective implementation and institutionalization of the key process area. Lack of formal theoretical basis: Models are based on the experience of "very knowledgeable people". Vague empirical support: Without a comparison of alternative process models under controlled conditions, the empirical case can never be closed and most accounts remains anecdotal. Revere process but ignore people: Process can never make up for mediocrity, and thus, any maturity model should be viewed as an element of a larger whole encompassing employee skills and aptitudes as well as the corporate cultural environment. Reveres institutionalization of processes for its own sake: Too much focus on the “ability to commit” can easily blur the “ability to execute”. Encourages displacement of goals from the true mission of improving process to the artificial mission of achieving a higher maturity level: This has been a frequent criticism of other similar concepts such as ISO and SixSigma, where the “culture of x” becomes the mission. Little information about process dynamics: Why each element is defined at the level they are is quite suggestive, as mentioned in the first item. Despite those concerns, a maturity model brings value where there are no better or reasonable alternatives, and as a mean to assess the current and desired state, as well as a communication and change management tool. At the same time, those caveats are strong indications of opportunities for further research. As Bill Gassman commented on the first post in the series "The first benefit of a maturity model is the conversation it sparks. It puts the team in a mindframe to imagine what could be and to measure where they are." Critics of 6 current models, the WAMM model itself and several case studies: Toyota Motor Europe (with the help of Michael Notté), Quebecor Media - Canoe (Simon Rivard), SaveTheChildren.org (thanks to Adam Laughlin) and a failed project (name retained for obvious reasons!). View all posts on Maturity Model topic.